I don’t have the best peripheral vision which means that I often walk into tables. Of course it’s the corner that knocks my thigh and I always have bruises on my upper legs. My shins don’t fare much better as I walk into anything left lying around the workshop or the open drawers of my desk. I navigate by memory and so really felt stupid when I fell at gym. I changed my routine to get 2 days training done in one go. Instead of walking around a set of machines like I usually do, I walked between them. My foot caught the bottom of the inner thigh foot rest and I landed face first on the floor. My knees and cheek have carpet burns and my head made enough of a noise for people to notice the tumble. Thankfully the owner of our gym has ice packs in the freezer and I walked around with it like a huge old fashioned mobile phone was attached to my ear. We got home and I took medication for the headache and pain and arnica for the bruising. Thankfully I don’t have a black eye. But my cheek bone was sensitive to the touch for more than a week. Are you prone to walking into things? This recipe comes on my list, it just sounds so delicious. I totally love salads. Thanks for sharing. Lovely salad. We have preserved kumquats which will work well in it. Do you have kumquats? Oh, I am so going to buy kumquats and try preserving them, thanks for that Tammy! I’m not a fan of tomato either but I see you have suggested cuumber as an alternative so I can try that. Though not a fan, that salad does look deliciously cool and refreshing. I’m not a big fan of tomatoes but this salad looks delicious and refreshing. Oh no Tandy! That’s awful, not only were you bruised and battered, you had to walk around with an ice pack strapped to your head too. I hope you are okay. I’m not traditionally one to walk into things, but when I do, I somehow manage to keep hitting the very same sore spot. Loving your pretty Moroccan Tomato Salad, its so pretty and perfect for the bazillion degree heat we are experiencing at the moment. Take care! Hope your heat wave breaks soon! Alas, I too always have random bruises, cuts, and scrapes, so I feel your pain. 🙂 Glad you were able to get an ice pack right away! Hi Tandy, I am prone into walking into things too, sometimes I get so mad at myself. Love everything about your beautiful salad. Thankfully your all right. I always get mad at myself when I walk into my drawers at work! Oh the gorgeous salad you teased us with that go with the lemons! Ouch that must have hurt! Yes wall frame move and get in my way all the time! This tomato salad looks absolutely wonderful. I just love the simplistic flavors of this dish as well. Sorry to hear you got hurt! Hope you feel better soon! 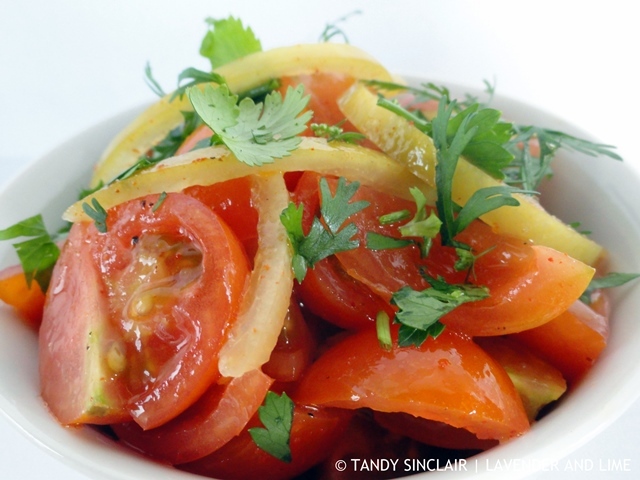 The moroccan tomato salad looks so healthy, fresh and delicious! I am terrible for walking in to things as I have dyspraxia, so I am always covered in bruises. This looks like one delicious salad. This salad just looks so inviting and fresh and would accompany so many dishes nicely =) Walking into things! Oh yes, I think all my friends think my husband beats me as I have so many bruises all over my legs! And really, I run into the corner of things all the time, mostly the t.v. stand! My legs are a big, bruised mess. I don’t know what my excuse is though. Happy Monday! Oh Tandy – I hope your bruises heal quickly! Sometimes Itend to walk into things too – but mostly its because I am not paying attention and trying to read and walk or something equally crazy. BTW – this tomato salad sounds so refreshing! You tell me, Tandy! Due to my tinnitus I gracefully sway around all day, it is worst when I suddenly get up and hit walls! Lovely recipe and I like the addition of the preserved lime skin, you make me dream of summer and dinners al fresco! I’d be prone to add some roasted cumin (I can hear my family’s sigh and muttering: there she goes again …).